Zillow's (Z) stock more than tripled after its IPO Wednesday, then fell back to settle up a mere 79% at the close. Initial public offerings have become a way to make huge profits in the market, if investors have the stomach for extreme risk -- and the access to buy in. 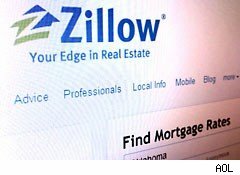 Zillow tracks home values across the country, offers the data online, and sells ads on its site to make money. It had only $30.4 million in revenue last year and lost $6.7 million. Those numbers are modest, but not modest enough to keep the firm from having a market cap now of almost $950 million, a breathtaking multiple of sales. The media has been quick to point out that the new Internet IPOs have values that may be unsustainable, but the path to making money in the stock market often has nothing to do with rational assessments of the future of a firm's shares -- or its estimated revenue. People who buy such shares often sell them the next day, or the next week. A case in point is LinkedIn (LNKD), the online community for professional networking. Any investor with the money could have bought shares at $70 on June 24 and sold them for almost $110 on July 15. It has trended down a bit since then, but even Thursday, it was still trading close to $100. During most of the run up, Wall Street analysts said the shares were too expensive. That may be true, but the market ignored the cautions. Pandora Media (P), the Internet radio operator, also gave investors a chance to make a great deal of money in a short time. Shares traded for $14 on June 23. The stock traded for over $21 on July 1. But investors who bought those shares at their IPO price of $20 haven't had many days when they could have sold them at a profit. After the initial day's flurry of excitement, shares dropped below the offering price, and haven't made a sustained advance past it since. There are more significant Internet IPOs due in the next few weeks. One is for group buying coupon firm Groupon, which some experts have valued as high as $10 billion. The company had revenue of $645 million in the first quarter. It also lost $103 million. Game company Zynga will also probably go public. It made only $11 million on revenue of $235 million in the first quarter of 2011. But some investors are apparently valuing Zynga in the $7 billion to $10 billion range. The profit-and-loss numbers for each company are modest enough to cause some Wall Street experts to challenge those sky-high valuations. Here's the point: It really doesn't matter what these companies are worth on paper -- or in reality. Traders who move in and out of stocks quickly don't care. Some investors may double their money on Groupon, if it trades like LinkedIn and Zillow did immediately after their IPOs. Or they may take a hit, if they time their moves wrong and Groupon acts more like Pandora. All it appears to take are guts and luck. Also See: A Step Forward for Real Estate?